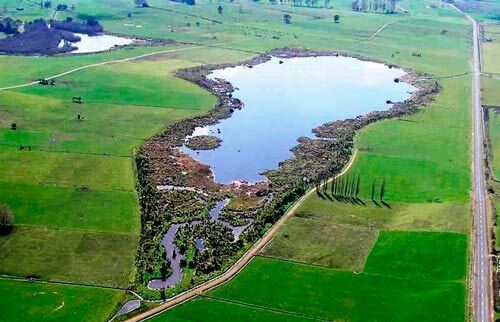 A restoration programme is being carried out at Lake Kaituna in the Waikato. A local farming family, the Hayes, became concerned about the state of the lake in the 1980s and 1990s. They formed a local restoration group, including duck shooters. In 1999 the group cut down willows that were invading the wetland. They fenced off the area, creating a buffer zone of native vegetation between the lake and the dairy farm, and made the shallow ponds in the foreground as a habitat for waterfowl.